Sydney CBD’s first 6-star high-rise. The iconic 29 storey, 47,000 square metre tower is located in the heart of the CBD and provides spectacular views across the famous harbour. 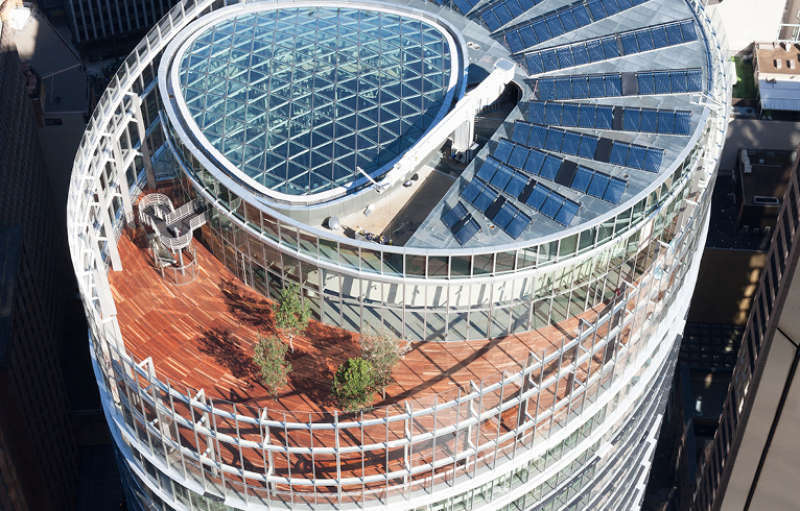 1 Bligh Street combines remarkable architecture with best practice sustainability. The project boasts a double skin façade along with a naturally ventilated full height atrium and of course, a complete Aquacell blackwater recycling plant. In fact, Aquacell was awarded the first combined private network/retailer’s water recycling license in New South Wales for the 1 Bligh Street development and in the process, we made 1 Bligh Street Sydney’s first high-rise commercial office tower to incorporate blackwater recycling technology. The blackwater plant saves and recycles 100,000 litres of water a day – that’s over 22.7 megalitres per year. This recycled water is then distributed around the building for non-drinking purposes, with 75,000 litres used in the cooling towers and 25,000 litres for toilet and urinal flushing. Wastewater is also mined from the nearby sewer main to supplement the building’s blackwater flow. All up, this integrated system easily meets the building’s non-potable water demands with amazingly little reliance on existing public infrastructure. It’s a really big building with really small bills. ongoing operations and service contracts. Contact us for more information about 1 Bligh Street, or you can download the case study.